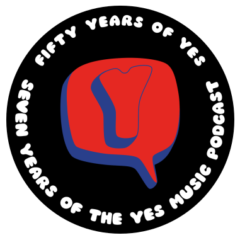 The eighteenth episode of the Yes Music Podcast featuring the seventeenth studio album, ‘Open Your Eyes’. Billy Sherwood joins but there’s no ‘official’ keyboard player – does it matter? How consistent is the quality of the songs? No epics – no good? Was I just dreaming about Keys to Ascension and Keys to Ascension 2? OMG you are just fascinating musical indigestion really? I’m still hold my gut. I do have to tell you that when they tour with this album I gave my tickets to my two oldest boys at the time because as you mentioned this really not one of my favorite albums funny though I really did like Man on the moon to me that was a Squrie song all the way. Oh and by the way I think you could do your own prog rock radio show around the world no problem I think that you have a very special talent I really enjoy hearing you each week. So until next week take care and as always great job! Hi Paul. I loved the OYE tour date I saw but it was my first, so special for me. As for radio show, it has always been my ambition to work for the BBC 😉 Thanks for another kind comment! I remember 1997 being a very confusing/exciting time for a Yesfan depending on how you look at it. KTA2 and OYE were released around the same time (at least in my part of the world) on different (competing?) record labels, the Beyond & Before/Something’s Coming BBC sessions album had been released on yet another label, Rick was in, Rick was out, Billy had mysteriously ascended from producer to band member, etc.. But I first heard some of these new songs prior to release of either album in the early days of MP3s over dial-up modems. I got hold of New State Of Mind, Open Your Eyes, Fortune Seller and Mind Drive, all at the same time! I was blown away. All the makings of what I thought would be a blockbuster Yes album with a classic long piece to die for, and sophisticated prog-pop songs to round out the other side, and perhaps even get them some airplay. Wow I agree with Ben totally here in the US air play for Yes is always the same old stuff all good people, roundabout , long distance (with out the fish) and on a rare occasion yours is no disgrace. I would call the radio stations begging them to play anything other than those tracks and of course they would not. I would love to hear Mind Drive on the radio or close to the edge or hell even Tales….lol sorry Kevin did not mean to swear.I think Kevin should make a prog radio show along with his wonderful podcast why I think it would be outstanding! Thanks again, Paul. Your comments and Ben’s show the depth and breadth of Yes fans’ experiences across the globe. Thanks so much for sharing! I hope I can manage to sort out the round table session so we can all talk. I have always admired Open Your Eyes. I have to admit it was a bit bittersweet for me when Rabin left and Howe came back, I was sad to see Rabin leave but thrilled to have Steve back. Sherwood as a member of Yes was thrilling and the production on this one is fantastic! My favourite cuts have always been New State Of Mind, Somehow Someday, The Solution and the title track. Very interesting how this album came about between Squire/Sherwood recordings and if you seek out their first Conspiracy record it is of similar origin. Saw them on tour in late ’97 with Igor Khoroshev on keyboards and it was a great show, however they only played the title track from this album at the show and I left the concert a bit upset because of that. I saw them on the Open Your Eyes tour and I really liked Billy Sherwood’s contribution. I believe he’s a really great guy. I also enjoyed Igor’s playing but,as we know, he has his own special place in the Yes drama!